It’s been nearly four decades since Carl Sagan first addressed the general public from a scientist’s perspective, confronting the possibility of extraterrestrial life. David Grinspoon, a planetary scientist who has helped to shape modern planetary exploration, brings the subject to a new generation of readers with his reflections on the most recent developments in astrobiology, including NASA’s search for life on Mars. In Lonely Planets, he investigates the big questions: How widespread are life and intelligence in the cosmos? Is life on Earth an accident or in some sense the “purpose” of this universe? And how can we, working from the Earth-centric definition of “life,” even begin to think about the varieties of life-forms on other planets? Using the topic of extraterrestrial life as a mirror with which to view human beliefs, evolution, history, and aspirations, Grinspoon provides an authoritative scientific narrative of cosmic evolution, along with provocative ruminations on how we fit into the story of the universe. An accessible, lively blend of science, history, philosophy, and personal narrative, Lonely Planets reveals how the search for extraterrestrial life unites our spiritual and scientific quests for connection with the cosmos. In Lonely Planets, David Grinspoon brings together what has never before been synthesized: the history, science, culture, and politics of the search for life in the universe. Along the way, you will not escape his practical and often humorous observations of the quest; he is a planetary scientist as well as a dreamer, borne of the space age. An exuberant, provocative look at the possibility of extraterrestrial life, and what it might mean….Wisecracks, philosophical musings, and personal anecdotes make his text as lively as it is authoritative. The best look at this subject since Carl Sagan’s Cosmic Connection. It’s one thing to write a critical examination of the flawed thinking that has shaped the way science considers the possibility of extraterrestrial life; it’s quite another to write one that actually begins “It was a dark and stormy night…” Such is the arched-brow humor favored by this astrobiologist and NASA adviser, who drops quotes from academic stalwarts like Madonna, R.E.M., and The Onion. Yet, in his low-key, conversational language, Grinspoon asks provocative questions about modern science’s unyielding rigidities; gives an informed, dispassionate consideration of the UFO phenomenon; and suggests that NASA might be a tad too preoccupied with Mars. Definitive proof that life on this planet is intelligent and funny. Are we alone in the universe? That’s probably the most compelling question in all of science. Lonely Planets obviously can’t provide an answer, but for anyone who has ever had his or her own curiosity about the possibilities of ET life, it can provide a wealth of information and entertaining insight. There are a number of noteworthy scientists now vying for the crown of premier science popularizer worn with such distinction by Sagan. With the addition of Lonely Planet to his earlier Venus Revealed, Grinspoon stakes his own strong claim to that crown. Astronomer and space advocate Grinspoon pulls lots of facts, hypotheses, and beliefs together in this entertaining consideration of the likelihood of encountering extraterrestrial life. Nevertheless, the book is orderly, as well, starting with the astronomical and social history that enabled reasonably learned minds to hypothesize about other worlds and the possibility of life on them, and continuing with what has been learned during the past four decades about the solar system and what lies beyond it. Grinspoon describes the intricate four-centuries-old dance of astronomy and biology, and concludes by discussing where theories have been reached. He seasons the discussion with witty anecdotes, personal experiences (relevant, since he has worked with NASA since he was a student), and reminders of what has been demonstrated and what is still theoretical. Fun to read, Grinspoon comes across like a buddy in a bar, trying out ideas over a beer or few. He deserves a large readership. David Grinspoon has done all of us a service by putting together his lively and playful look at the history of beliefs about alien life forms and the current spectrum of such beliefs, including the best and worst science regarding E.T. life as well as some of the more faith-based approaches now current. It is a fun book, and should be read by anybody serious enough about Astrobiology to want to know where it came from, and where it might be possible to go. Anyone, even a professional scientist, who wishes to become familiar with contemporary astrobiology should read this book. It’s a prime place to become more than casually acquainted with one of the hottest, most interesting fields of science. Lonely Planets is a Lonely Planet guide to the universe, packed with useful information served up with a wry, amusing twist. But rather than learning about trekking through Nepal, in David Grinspoon’s new book you’ll discover why and how humanity is so fascinated by the thought of life elsewhere in the cosmos. Grinspoon offers an up-to-date picture of the search for extraterrestrial life and the prospects of finding it in a universe that we now know contains other solar systems. It also covers the nearly four centuries that the search has been under way since the initial observations of Renaissance astronomers. As soon as biology joined the inquiring minds, theories multiplied thick and fast; the historiography of the scientific debate is complex and has the potential for being unbearably dull. But Grinspoon handles the wide variety of material necessary for a coherent narrative with great aplomb, marshalling material such as the charming Conversations, a 17th-century dialogue by a French astronomer in which a philosopher and a marquise debate astronomical topics. Even when he turns to physics, the author runs to phrases like “the Sun in its wild youth” to describe the energy output of various kinds of stars, making this book less a popularization than a personable chat on life, the universe and everything. 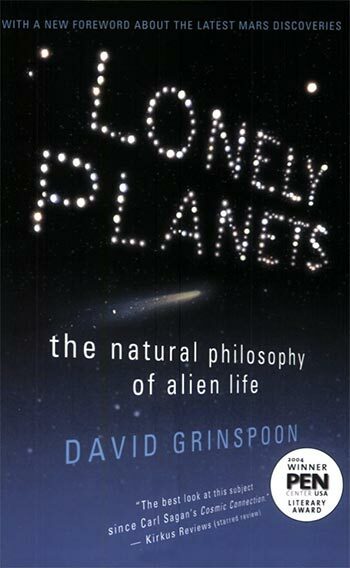 In Lonely Planets David Grinspoon has written the best book about the nature and place of life in the great cosmic scheme of things that I can imagine. He is solidly grounded scientifically and yet willingly addresses the big questions that so many scientists avoid. And he does it with such delightful aplomb and sudden good humor that it is a true pleasure to read. If you want to know what science is grappling with the origins, evolution, and extent of life and how it fits into our understanding of the universe, read this fascinating book by an wonderfully articulate insider.